However, Pritpal then started finding himself being trolled on Twitter – by people who objected to the idea of publicly naming and shaming racists. 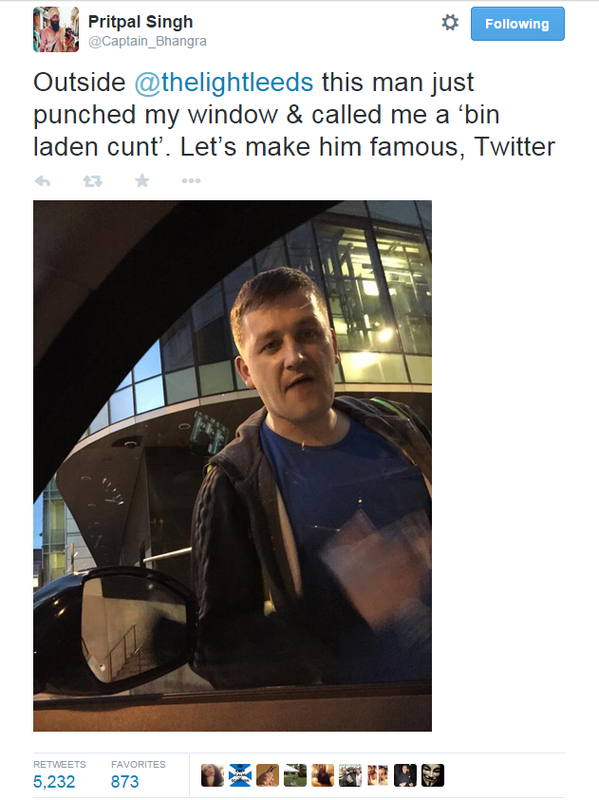 In my opinion, if someone doesn’t want to be named and shamed for a racist attack – don’t racist attack anyone. 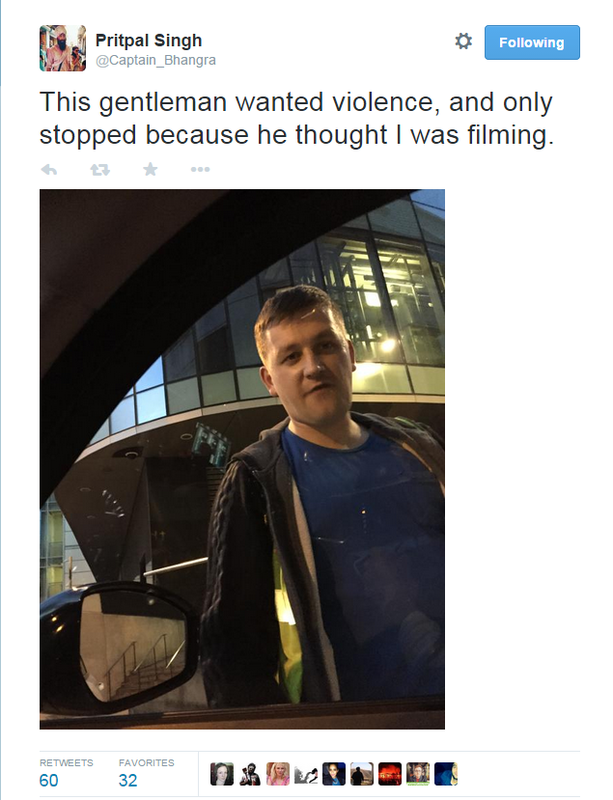 We should be using the technology more and more to identify not just racist thugs but other unsavoury characters. Twitter is a hot bed for all kinds of extremists; racists, MRAs and gamergators (Video game anti-diversity fundamentalists – yes we’re that doomed!) all love to engage in harassment campaigns against targeted women and minorities. It’s a shitfest that has got so bad that Twitter is now finally developing anti-abuse measures to be put in place later. We are all accountable for our actions. Definitely name and shame. We are not in the Victorian days; don’t talk about it, sweep it under the carpet, leave it to others to resolve – “it’s not our problem”. Oh yes it is. Bullies thrive on the possibility of anonymity. What sort of society do we want our kids to inherit? victorians loved gossip and scandal (soap operas)…naming and shaming is useless, and denied shame/guilt is in fact very close to the root cause of it…obvs talk about it, don’t sweep it under carpet, but get to the root of it or nothing will change, for the bullies or the victim…the trouble is SWARMING ie group denial often noted as terror of the bully, being left isolated, ganging up on the victim….psychopaths are is curable, as posted above, but they have to want to be cured, and they all do, when given shown truth and reliable support…. They now claim thar we should have the right to call mentally ill people mad and dangerous loonies. This shows the twisted, vicious mindset of some of the creatures skulking on Twitter. Although Mr Singh is the victim of racial abuse, the Nazi trolls are targeting him for victimisation. There really are some nasty, subhuman bullies out there in cyberspace, with a complete inversion of moral values. As for the insult itself, it’s unfortunately almost stereotypical. According to the anti-racist organisations, Sikhs were the first people to find themselves attacked and racially abused after 9/11. They were targeted because they wear turbans, just like Osama bin Laden. And despite the fact that they’re a totally different religion and ethnic group. Still, makes no difference to the kind of racist goons we see here, who obviously just want a Black or brown face they can abuse. The racists are vile, but their bullying and assaults led to a public awareness campaign by the Sikh community to reassure everyone else that they’re not a danger to anyone. It shows a young Sikh man and woman smiling at the viewer, with the slogan ‘Don’t Freak – We’re Sikh!’ It’s a great poster and an excellent response to needless fear and prejudice.